NEW: Access the Deeprange Survey Images via the NOAO Science Archive! NEW: Access the Deeprange Cluster Catalog - Now with active links to SDSS! The nature of large-scale structure at high redshift is unknown but is now accessible with large area CCDs. In an effort to improve our understanding of the evolution of large-scale structure, we have recently surveyed a contiguous 16 square degree area in the I-band using the prime focus CCD camera on the Mayall 4m telescope at Kitt Peak National Observatory. Our survey is the first of a new generation of deep, wide-area imaging surveys to study structure at high redshift. The aim is to use the faint galaxies and distant galaxy clusters within this survey to probe large-scale structure evolution over 0 < z < 1. A map of the ~710,000 galaxies in the survey is shown above (and in the results section). The goal is to set accurate limits at z = 1 on the amplitude of structures now seen at z = 0. Redshift surveys show that inhomogeneities in the distribution of low redshift (z < 0.1) galaxies and clusters exist on scales up to 30/h Mpc (and probably even larger). Deeper pencil beam surveys hint at equally large-scale perturbations at moderate redshifts (z ~ 0.5) ( Broadhurst et al. 1990), but cannot elucidate their nature, given their extremely limited area coverage. Observational constraints on the evolution of large scale structure provide strong limits on structure formation theories because coherent structures on scales >10/h Mpc are still in the linear regime. It is precisely in the linear regime where important distinctions can be made between competing theories. Currently, very little is known about the evolution of large scale structure and this survey will provide an important breakthrough. To explore large-scale structure at z = 1 , our survey had to subtend at least 75/h Mpc and hence a minimum angular dimension of 4 degrees was required. Furthermore, to avoid severe aliasing effects and unfavorable window functions, we chose to keep both angular dimensions comparable. A number of previous observational constraints lead us to these requirements. First, to extract reliable anisotropy limits on the cluster distribution demands survey dimensions comparable with the turnover in the galaxy power spectrum. Second, the cluster-cluster correlation length is at least 16/h Mpc at low redshift. To measure the high redshift cluster correlation function with accuracies comparable to those at low redshift our survey must contain at least 300 clusters (approximately 25% of the clusters would be at 0.85 < z < 1.15). 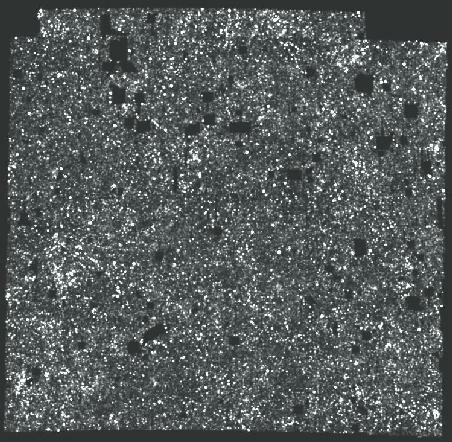 Current estimates of the surface density of clusters from small area surveys ( Gunn et al. 1986, ApJ, 306, 30; Postman et al. 1996, AJ, 111, 615) are in the range 20+ clusters/sq deg out to z = 1, thus an area of 16 square degrees is required. Lastly, high order correlations can establish consistency between the clustering properties of galaxies and of clusters, a link which must be explained by any theory of galaxy formation. To perform this test at high redshift requires a survey which is comparable in dimension to the cutoff in the cluster correlation function: 50/h Mpc. The KPNO 4m prime focus CCD camera has a 16 arc minute field of view (0.47 arcseconds per pixel) and, thus, we were able to survey 2 square degrees per clear night (roughly 32 exposures per night). Each pointing overlaps its adjacent pointing by 1 arcminute. The overlap assures that we can track any photometric zeropoint variations to within 2% or better. We map out 16 square degrees using a 4 degree x 4 degree square geometry. To cover this area thus requires 256 overlaping exposures. Our exposures are 900 seconds in duration. This allows us to reach a 4-sigma completeness limit of I=23.5, sufficient to detect cluster galaxies 2 magnitudes fainter than the typical unevolved first-ranked elliptical at z = 1 (spectral evolution will help, making the galaxies brighter and easier to detect). Two examples of distant clusters that have been discovered in this survey are shown at the bottom of this page. The field of view in both images is 4 arcminutes on a side (i.e., only 1/16th of the field of view of a single prime focus CCD image). Going to this depth was essential -- a shallower survey would only be sufficient for detecting the very richest z=1 clusters and would limit our conclusions about evolution of structure. (At I = 23.5, we are able to detect z ~ 1 Abell richness class 1 systems). Since we also wish to conduct follow-up spectroscopic surveys based on these images, it was desireable to have the data reach the spectroscopic limit of 8 - 10m class telescopes with a reasonable signal-to-noise ratio. Fringing was minimized by using the prime focus camera scan table. After some experimentation, it was determined that a 60-pixel scan was the optimal choice (the fringe amplitude decays more slowly with scan size when the scan size exceeds 60 pixels but decays quite rapidly with scan size for scans less than 60 pixels). As can be seen by inspection of the two example images on this page, the reduced data typically flatten to 1 percent or better! by virtue of its high galactic latitude (+51 deg), low HI column density (2.2 x 10^20), high declination (increased visibility from KPNO), low IRAS 100 micron cirrus emission, and the absence of many bright stars or nearby rich clusters. Click here to see an ascii table of the 256 J2000 Survey Grid Coordinates . Immediate products of the survey will be objectively derived catalogues of distant galaxies and clusters. Constraints on structure from the 2D survey alone will be made by performing galaxy count fluctuation measurements on scales up to half the survey size and from an n-point angular correlation function and power spectrum analysis on the galaxy and cluster distributions (e.g., the galaxy angular autocorrelation function on scales of 2 - 3 degrees to this depth has not yet been measured -- we will determine if the observed break in the galaxy angular correlation function persists at faint magnitudes). We will also investigate photometric cluster properties as distance indicators to attempt studies on the large-scale cluster distribution without the need for a complete redshift survey. The best constraints on high redshift structures, of course, will come from a follow-up spectroscopic survey of a representative sample of the galaxies and clusters. The large contiguous area will allow unambiguous identification of the ``spikes" seen in the redshift histograms from recent deep pencil beam surveys. Cluster detection will be performed using the matched filter technique described in Postman et al. (1996). We will also employ a wavelet cluster identification technique (Holden and Nichol 1996). The matched filter method has the advantage that it provides both a physically meaningful richness estimate and a redshift estimate. As of March 1996, the imaging phase of this survey has been completed. As of April 1997, galaxy catalog construction has also been completed. Cluster detection has been accomplished and the n-point correlation function analysis has been completed. Spectroscopic observations of detected clusters are underway using NOAO facilities. See publications below for details. Postman, M., Lauer, T. R., Szapudi, I., & Oegerle, W. 1998, Astrophys. J., 506, 33. Szapudi, I., Postman, M., Lauer, T., Oegerle, W. 2001, Astrophys. J., 548, 114. Postman, M., Lauer, T. R., Oegerle, W., Donahue, M. 2002, ApJ, 579, 93. An I-Band Selected Sample of Radio-Emitting Quasars: Evidence for a Large Population of Red Quasars. White, R. L., Helfand, D. J., Becker, R. H., Gregg, M. D., Postman, M., Lauer, T. R., Oegerle, W. 2003, AJ, 126, 706. To access our I-band images: Click Here! To access the cluster catalog: Click Here!